For smallholder financial solutions to succeed, providers require support from an enabling environment. Previous ISF and Lab research identified components of this environment, from Inflection Point which demonstrated the relationship between financial service providers (FSPs) and capital providers, to ISF’s research on the role of government policy and smallholder finance and the market for technical assistance providers in developing countries. The relationship between the enabling environment and smallholder finance is complex, and to date, there is limited research on the link between the success of specific smallholder products and services and factors in the enabling environment. However, the Mastercard Foundation’s rural and agricultural finance portfolio – ten programs spanning 26 countries in sub-Saharan Africa – should provide an opportunity to understand more about this relationship. Part 6 of the Pulse series highlights some early learnings from this portfolio and makes recommendations for future research to close the knowledge gap. The smallholder finance environment is determined by at least four key elements, including the regulatory, financial, knowledge, and digital infrastructure of a given country or context. 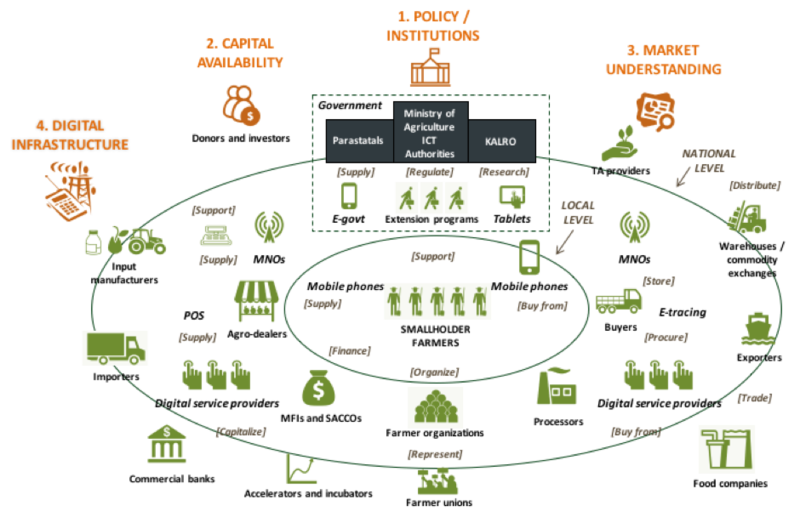 Within this environment, there is an ecosystem of players operating to provide smallholder farmers financial and non-financial services, including microfinance institutions and savings and credit cooperatives (SACCO); state bank, commercial banks and niche lenders; digital service providers; TA providers; agribusinesses and off-takers; and farmer organizations. While more research is required, some early learnings are emerging from the Lab’s work with Mastercard Foundation RAF partners. Policies by government and regulators can encourage or discourage lending to smallholders. AGRA found that if governments regulate the use of collateral and streamline land registration procedures, the risk of agricultural lending decreases and financial institutions (FIs) are encouraged to enter the market. As a result, farmers in Burkina Faso with no registered land, for example, are seeing increasing access to finance. In Kenya, interest rate caps are preventing some FIs from serving the SHF market, as they cannot factor the estimated risks of this new segment into their pricing. Market understanding generally, FSPs lack a mature understanding of smallholder farmers, constraining potential borrowers from designing effective services and products. In Rwanda, ICCO observed that limited sector-specific knowledge kept SACCOs from lending to the agriculture sector. More broadly, lack of data on the SHF market has typically made it difficult and costly to identify and target specific segments of smallholders. Capital availability both the availability and price of capital affect the success of new business models. In Kenya, digital financial services (DFS) offer great promise for smallholder solutions but require heavy upfront investment. Mercy Corps notes that many DFS start-ups are progressing slowly because they are self-funded, unable to find venture capitalists or even donors to take on the risk. In Ghana, central bank interest rates of 21% lead to market interest rates of over 30%, even for low risk customers. Here AGRA observes that the cost of capital is making it unattractive and too expensive for FSPs to lend to new or challenging segments such as SHFs. Digital infrastructure Including agent networks, is needed for cost-saving mobile-based solutions to take off. A Mercy Corps Ecosystem Review in Zambia identifies a lack of sufficient, affordable and trusted cash agents, merchant acceptance and other digital service points in rural areas as key constraints for SHFs to access and use DFS. The study also finds that financial institutions are making limited investments in providing services to rural areas because of high operational costs and low investment opportunities as a result of small and infrequent transactions. 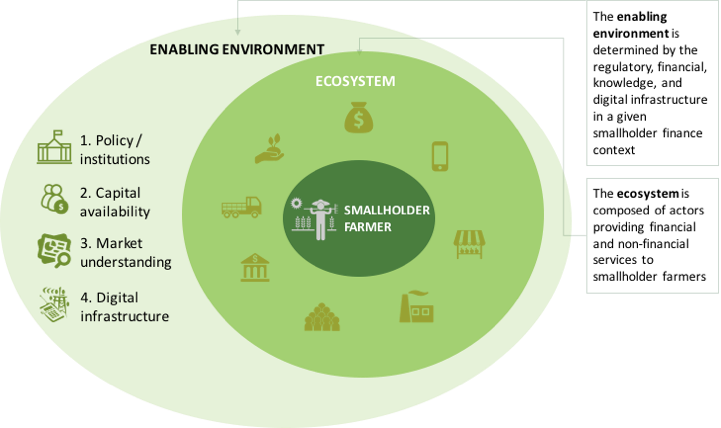 Ecosystem players for FSPs, building connections between value chain actors and smallholders is challenging and costly but critical to boosting product development and uptake­. In Rwanda, ICCO found that linkages between informal village savings/loan groups and formal FIs allow organizations to overcome geographic limitations and assymetric information. The World Bank’s 2016 Enabling the Business of Agriculture dataset provides country data on a range of key indicators – including market, policy, and ICT measurements – that provide insight into the enabling environment. Nathan Associates’ 2015 study found that traditional public goods for information-sharing among FSPs must be adapted to the rural agriculture context. They also found that training of credit officers to understand smallholder profiles and needs can dramatically improve the performance of agricultural finance. CGAP found that without an adequate infrastructure and an extensive agent network, shifting from cash to digital payments requires a substantial upfront investment and can result in additional burden on smallholders. New Markets Lab takes deep looks at specific policy settings with implications for smallholder finance. Their recent work with IFAD addresses legal and regulatory issues to scale up value chain development, which includes assessments of legal and regulatory issues related to land tenure, seed and input markets, financial services standards, and trade. Going forward, we are exploring whether the industry could benefit from a typology of country enabling environments that can help FSPs determine which types of services are likely to be successful, and how products/services and business models might need to be adapted when expanding into new countries. In addition, there is a need for better understanding of best practices for coordination between ecosystem players, and the potential for such coordination to overcome inherent challenges in the enabling environment. Financial institutions, agribusinesses, funders and other ecosystem players could use this knowledge to navigate and foster strong smallholder finance environments that can lead to better financial solutions.